On Saturday, Red Mountain hosted the first ever Broken Goat. Jul. 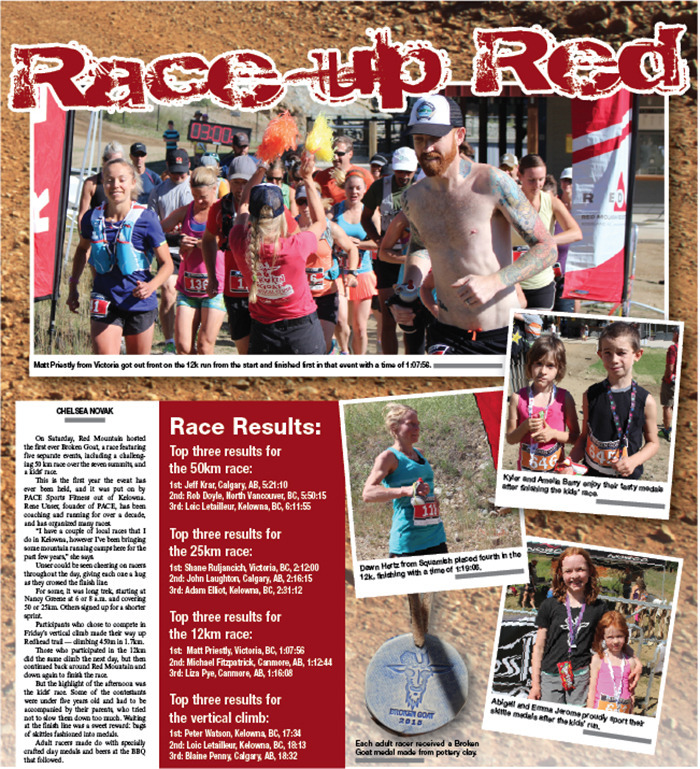 24, 2015 8:00 a.m.
On Saturday, Red Mountain hosted the first ever Broken Goat, a race featuring five separate events, including a challenging 50 km race over the seven summits, and a kids’ race. This is the first year the event has ever been held, and it was put on by PACE Sports Fitness out of Kelowna. Rene Unser, founder of PACE, has been coaching and running for over a decade, and has organized many races. “I have a couple of local races that I do in Kelowna, however I’ve been bringing some mountain running camps here for the past few years,” she says. Unser could be seen cheering on racers throughout the day, giving each one a hug as they crossed the finish line. For some, it was long trek, starting at Nancy Greene at 6 or 8 a.m. and covering 50 or 25km. Others signed up for a shorter sprint. Participants who chose to compete in Friday’s vertical climb made their way up Redhead trail — climbing 450m in 1.7km. Those who participated in the 12km did the same climb the next day, but then continued back around Red Mountain and down again to finish the race. But the highlight of the afternoon was the kids’ race. Some of the contestants were under five years old and had to be accompanied by their parents, who tried not to slow them down too much. Waiting at the finish line was a sweet reward: bags of skittles fashioned into medals. Adult racers made do with specially crafted clay medals and beers at the BBQ that followed.